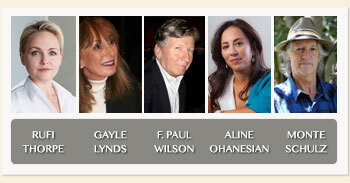 SBWC 2015: June 5-10, Hyatt Santa Barbara Dear Writers,This is the last week to register for the early registration price of $575! The price goes up to $650 on March 16. For more information and registration, visit www.sbwriters.com.For those of you hoping to schedule a private meeting with an editor or agent at this year’s conference, Advance Submission is now open. You must be a registered participant to take part.We have ten participating agents/editors who represent a variety of genres including nonfiction and memoir. Find out more about our confirmed agents/editors by clicking on the link above. EVENING SPEAKERS You also don't want to miss our lineup of evening speakers who offer inspiration, funny anecdotes, sage advice and, most importantly, a sense that the sometimes lonely and daunting road to getting published is not so lonely after all. We are excited to announce this year's speakers, which will include Rufi Thorpe (The Girls from Corona Del Mar), Gayle Lynds (Mosaic), F. Paul Wilson (The Keep), Aline Ohanesian (Orhan's Inheritance), and Monte Schulz (Crossing Eden). We hope you’ll join us for another amazing and inspirational year.